Wishing you all a wonderful 2016, lots of exciting things to look forward to. Have a great 2016 all of you and good luck with the new baby, starting school, working full time! We wish Happy New Year to you all from the Far East. May the year 2016 be a peaceful one for the whole earth! Wishing you and your family the most amazing new year! Exciting times; do you know if it's boy or girl? Personally I never wanted to know, and let nature surprise us. Best of luck with everything, Cro. Happy New Year Kev and family. What a lovely picture of you all, what a lovely family. Happy New year to you all too, hope all goes well with the forthcoming birth. Don't worry, we'll all be following you in the new year and we do realise that you are going to be so busy work with and all, so no need to apologise. Happy New Year! Looking forward to seeing the new baby very soon. What's all over you'alls faces? 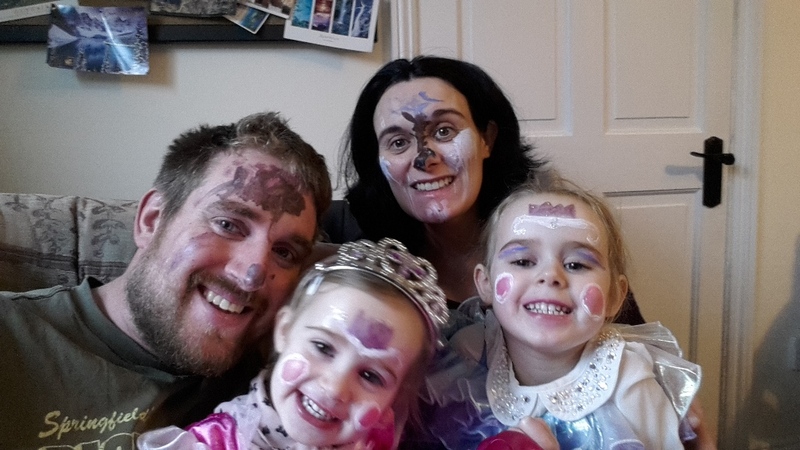 The girls asked father Christmas for face paints so we all got painted for Christmas! What a great photo! :o). You and your wife have two very cute little people ... umm well almost three little people :O).